Mix and coordinate our budget minded patriotic tableware basic, deluxe and ultimate kits with decoration decorations are designed in red, white and blue patterns. Don't forget our patriotic centerpieces and confetti for that patriotic table settings. The American Pride Dinner Plates features a patriotic design of red white and blue. Have all you need with our American Pride Party Pack for your 4th of July celebration! 60- Dinner Plates 60 - Dessert Plates 125 - Luncheon Napkins 50 - Blue Plastic Forks 1 - White Plastic Table Cover To process your order as quickly as possible, some substitutions may occur for solid color items in this party pack. 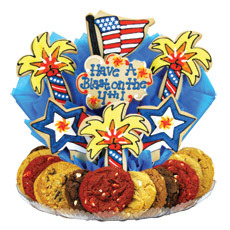 The Firecrackin' Fourth Cookie BouTray perfect way to celebrate your Independence Day with cookies. A fun, festive showcase for the Fourth of July celebration, filled with stars, stripes and Firecrackin' Fireworks!- This item is priced as a 7 cookie. These glitter Patriotic Mini 3-D Star Centerpieces feature a set of three cardstock stars with cutouts in red, white and blue. Each 4th of July Centerpiece measures 5 inches in diameter and looks great on a tabletop or when a string is strung through the top to hang from a doorway or ceiling for additional decor. Our glitter Patriotic Mini 3-D Star Centerpieces are a great way of decorating for a Welcome Home party also! this Star Gleam n' Burst Centerpiece is a great addition to any patriotic table. Each Star Gleam n' Burst Centerpiece is 15 inches tall and includes red, white and blue star bursts in a foil base. This Patriotic Cupcake Stand has a red, white and blue stars and stripes background that will hold plenty of sweet treats for your holiday party. Made of cardboard Measures 14 1/2" high Tiers measure 12", 10" and 8" in diameter Great centerpiece for holiday parties, election events and more! Inflatable Inflatable Patriotic Cooler Impress your guess with this cooler for any patriotic Party! Great for 4th of July! This inflatable is of an upside down Patriotic hat that can be used as a cooler. It can hold approximately 24 twelve ounce cans. When inflated, this cooler measures 27 Inch wide by 18 Inch tall.